Well, here it is - plant number 1,000 on my list! Bought at the Malvern Show yesterday and planted behind Skimmia x confusa 'Kew Green'. It's evergreen and HUGE!! I love it! Looks as if its always been there. Perfect together. Missed the Malvern show this time 'cos I had to work. It's a great place to find really nice plants.. I wounder are those people laughing now, it looks lovely also effective too. congratulations on your 1000 plant. I wondered who'd read its species name and think of John Wyndham, Grindle! As long as it doesn't pull up its roots and walk around, that's fine by me! LOL. I'll give you a yell when the Triffids walk! Eeeekkk!! Isn't that a bit invasive, Dd? ?....I seem to remember?? Yes I think it might well be..........decide to live dangerously ....!! i suppose you could always sink a barrier in round it?? And me! now all I need to do is to be imaginative and put plants in to 'go' with it!! This photo is of species Carex trifida. 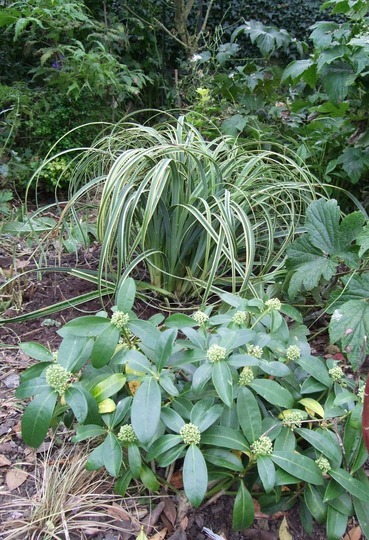 See who else has plants in genus Carex.